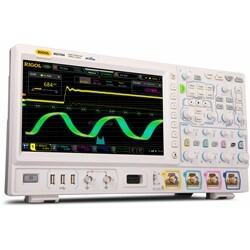 MSO7000 Rigol Oscilloscopes ! !Special Offers!! High quality 4 channel oscilloscope with 100 MHz Bandwidth, 10 GSa/s sample rate, up to 500 Mpts memory depth and a 25.7 cm touchdisplay 1024x600 pixel. Including integrated 16 channel logic analyser. Upgradable to a 2 channel 25 MHz waveform generator. 4 probes RP3500A (bandwidth 500 MHz), logic analyser cable with 16 logic probes, front panel cover, USB cable, power adapter and quick manual. High quality 4 channel oscilloscope with 200 MHz Bandwidth, 10 GSa/s sample rate, up to 500 Mpts memory depth and a 25.7 cm touchdisplay 1024x600 pixel. Including integrated 16 channel logic analyser. Upgradable to a 2 channel 25 MHz waveform generator. High quality 4 channel oscilloscope with 350 MHz Bandwidth, 10 GSa/s sample rate, up to 500 Mpts memory depth and a 25.7 cm touchdisplay 1024x600 pixel. Including integrated 16 channel logic analyser. Upgradable to a 2 channel 25 MHz waveform generator. 4 probes RP3500A (bandwidth 500 MHz), logic Analysator cable with 16 logic probes, front panel cover, USB cable, power adapter and quick manual. High quality 4 channel oscilloscope with 500 MHz Bandwidth, 10 GSa/s sample rate, up to 500 Mpts memory depth and a 25.7 cm touchdisplay 1024x600 pixel. Including integrated 16 channel logic analyser. Upgradable to a 2 channel 25 MHz waveform generator.